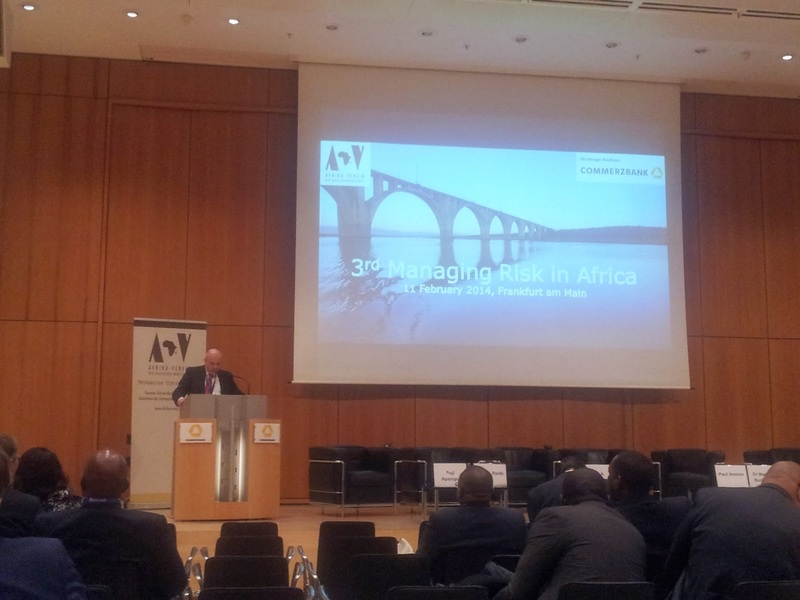 11.02.2014 Frankfurt, Germany - At the recently concluded conference themed 3rd Managing Risk in Africa Conference, many experts on doing business on the African continent were in Attendance. Below are some of the notes that I took. The conference was officially opened by Dr. Stefan Liebing, the Chairman of the organizing institution: Afrika-Verein der deutschen wirtschaft. In his opening remarks he emphasized the importance of distinguishing the fact that the conference is not called Risks in Africa rather Managing Risks in Africa. He further adds that the aim of the conference is not to talk about risks in African but rather how to manage risks in Africa. Additionally states that it is high time most organisations start viewing the African continent as potential strategic partners as opposed to a donations destination. Furthermore he cautioned German businesses to change their risk adverse behavior and mind sets. The fact is that there is predominantly more negative news coming out of Africa than good news is also discouraging some businesses from venturing out into the continent. In so doing you can assess the needs of the person over time and you adjust your risk management accordingly. How to avoid social risk? Why are most Chinese business persons interested in doing business in Africa? why now? The Chinese have been to the African continent since the 15th century. This is testament to the long sighted vision that china has about doing business on the African continent. Great Chinese leaders such as Chairman Mao Zedong have long encourage the trade relations between Africa and China. Now with the ever growing global village and most countries' political climate stabilizing it is now that most Chinese business people have the opportunity to venture into Africa. “If you want to make a spontaneous investment go to Africa, there is no plan for a concept to invest in Africa as is in Germany” – These are some of the sentiments expressed by Dr. Zhao Changhui, Chief Risk Officer at the China Export-Import Bank. Lanre Akinola, Editor of This is Africa a segment in the Financial Times, said the reason by the Chinese are fairing much better than their western counterparts is mainly because they are willing to go do the dirty work on working on the ground and getting to meet the people for a assessing the need for a product or service. He highlights this by sharing two examples. He recently gave a talk to students about investing in Nigeria at Cambridge, and after the talk he states that a young Chinese teenager of about 17 years approached him and told him how he (the teen) travelled to Nigeria to meet up with Chinese business people in Nigeria in the hopes of facilitating an agreement between himself and them. He was visiting Lagos, Nigeria which is termed one of the most dangerous places on earth. However as he drove past a bus station amidst the chao was a Chinese national with his suit and briefcase waiting to board the local bus. He utilizes these examples to explain the major difference that exist between the west and China. He further states that he has also seen westerners that aim to invest in Nigeria have private security firms drive them in convoys and tinted bullet proof with air-conditioned vehicles. With this analogy he aimed at illustrating that the Chinese are much more willing to interact with the locals whereas the westerners more often than not feel they are better than everybody else and tend to high western consultancies to do feasibility studies etc. “The secret is getting out of the jeeps and convoys to the ground with the people”. He does however offer a sigh of relief for these German companies that have not yet made it into the African market. Mr. Akinola advice's not to rush or panic as the time actually right at the moment to move into Africa just do your due diligence before making the move. Understand the place and you have nothing to fear. Is what China doing in Africa form of neo-colonialism? “China represents competition”, this are the words of Lanre Akinola. He further states that this is a huge debate in Europe now and that for a long time Europe had enjoyed a monopoly in the African market and now they feel threatened at the stiff competition. Dr. Zhao says the relationship between African countries will continue to grow. Sisi Modise CEO of SAIMS Consulting then asked: The relationship will continue, the question is, in which direction? Who is winning in Africa, multinationals, or the BRICS countries? Change BRICS to BRINCS to include Nigeria as this is a fast growing economy, these were some of the sentiments expressed. Joshua asked the question: Why are European companies moving away from Africa? it is research after research but they never move. This question was much appreciated by the audience. Well, German companies have a lot of regulations they need to follow that other companies in China for instance do not have to adhere to. Compliance is trend within the global business arena; this is even evident on the stock markets. Remember Siemens scandal. Soji Apampa, Co-Founder of The Convention onBusiness Integrity Nigeria, set the record straight by informing the attendees to refrain from assuming that Africa is a country but that couldn't be any further from the truth given the fact that even with once country so many cultures and views to life exist and viewing Africa as a country or having a one fit’s all risk management strategy is only detrimental to any business that has it. He also stated that the biggest problem SMEs face is the risk of information asymmetries’ betwixt the European and African companies. The conference ended on a high note. With a networking opportunity towards the end. In my opinion it is prudent for German SMEs to make a differentiation between African countries. I often get the "you are from Africa right?" I reply "Yes, just as you are European". This responds ushers some looks bewilderment, but the point I try to bring across is that Africa is a continent that has countries, Yes I am African but to be more precise I am Namibian. I often see statistics that compare countries and then aggregate results from some African countries into one as though the same mitigating factors exist in every country in Africa; there might be cross matches but you will never find two sets of variable that are identical, this is a statistical faux pas. All in all if German SMEs want to be successful on the African continent, they need to invest time and other resources into understanding the different cultures that operate in the environments that they aim to penetrate, be mindful that their way of doing business is not always a one fits all model and it is sagacious to adapt as needed: be a chameleon and have a long term strategic plan of what you aim to do in that market and how long you intend to stay; this is very important because it can create a domino effect if one German SMEs just up and goes most people associate that with all German SMEs leading to negative Word of Mouth.